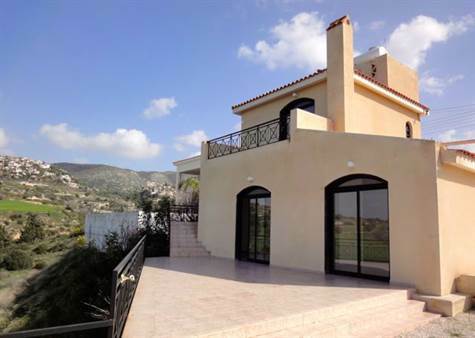 Tala, Paphos - Set in a quiet residential cul-de-sac in the hills of Tala, with breathtaking panoramic rural and sea views, this property is truly something unique. From the impressive large entrance foyer, steps lead down through an archway to the living accommodation. A stone chimney with open fireplace forms the centre piece of the room and nicely divides the lounge area from the dining space and corner kitchen. Patio windows provide lots of sunlight and easy access to the outside terraces. The stylish kitchen is modern and well designed with plenty of cupboards. A central island is the cooking hub with a built-in oven, electric hob and stainless steel cooker hood. On the far side is a built-in wine rack. Other appliances include a fridge/freezer and washing machine. A large walk-in cupboard off the entrance hall provides useful additional storage space. Corner steps in the entrance hall lead up to a hallway with a double size bedroom on the left and a large shower room on the right. The master bedroom with it’s large en-suite bathroom is on the top floor accessed via a solid wood staircase. Patio doors open on to a private balcony with absolutely stunning panoramic views. Outside, there are terraces all around the property, accessed directly from the downstairs bedroom, kitchen and living room. All have fabulous views of the sea and surrounding countryside. There is space for a swimming pool if required and the pipework is already in place.